I was lucky enough to make it through to the second round of Project Food Blog! Many thanks to the generous people who voted for me. Your reward is something delicious! Last year my husband and I went to Bavaria. Munich to be precise. A good part of my family came to America from the southern part of Germany, so I jumped at the chance to go. Munich was lovely, all old buildings and gruff yet lovable Germans, but what I remember most is the traditional Bavarian food. It is considered by the locals to be tourist food and can be found in beer halls that celebrate Oktoberfest year-round. These are places where you are more likely to hear people speaking English or French, and everyone has an enormous mug of beer. I did not go for the atmosphere, however I must admit I found it charming in a kitschy way. No, I went for the food. 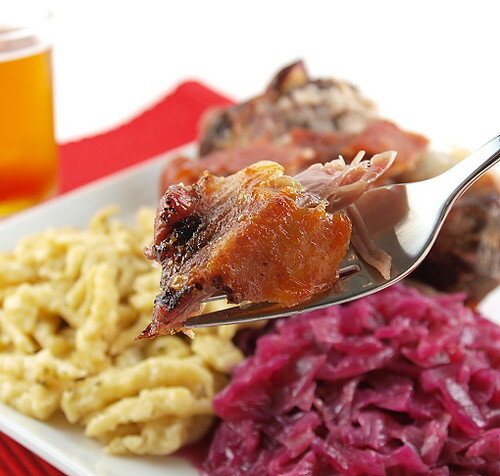 Bavarian food is hearty fare that fills the belly after a long day of work. Roasted meats feature heavily of the menu. One of the dishes I sampled was called Schweinshaxe, or pigs knuckle. It is an uncured ham hock that is seasoned, allowed to dry out, and slowly spit roasted until the skin is crisp and the meat is tender. It was, in short, the best roasted pig I had ever had and I vowed to one day make it for myself. That is where Project Food Blog comes in. Ready to tackle a classic dish from another culture? Pick an ethnic classic that is outside your comfort zone or are not as familiar with. You should include how you arrived at this decision in your post. Do your research then try to pull off successfully creating this challenge. Try to keep the dish as authentic as the real deal, and document your experience through a compelling post. 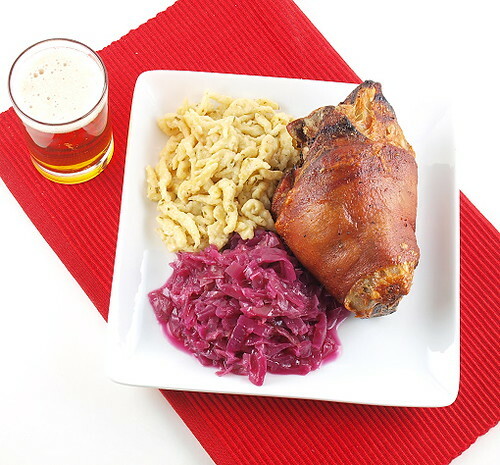 I discovered there are two ways to make schweinshaxe. One is to slowly braise the ham hocks in sauerkraut until tender. The other, and the method I employed, is to season the meat, let it dry out uncovered in the fridge for 12 hours, then to spit roast it until the meat reaches 190 F and the skin is shatteringly crisp. To complete the meal I made two traditional German sides, Spätzle (egg dumplings) and Rotkohl (sweet and sour braised red cabbage). 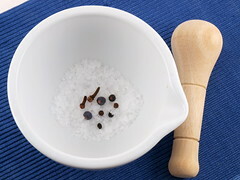 In a spice grinder, or a mortar and pestle, grind the salt, cloves, juniper berries, and peppercorns until there are no large pieces of spice remaining. Prepare a sheet tray with a metal rack on top. 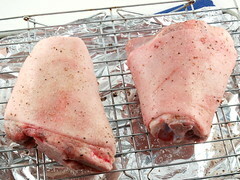 Place the ham hocks on the rack and season all sides with the salt mixture. Place in the refrigerator, uncovered, for 12 to 24 hours. 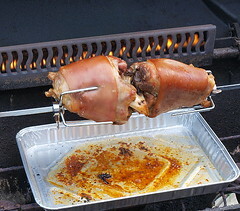 When ready to cook thread the ham hocks on to a rotisserie spit. Cook the hocks over high heat until the outsides are crisp and golden and the internal temperature reaches 190 F, abut 2 1/2 hours. Remove from the spit and rest ten minutes before serving. 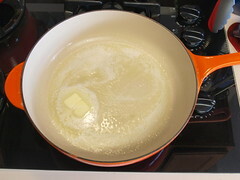 In a large pot over medium heat melt the butter. 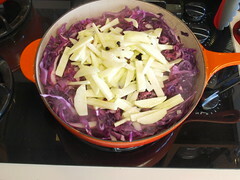 Once melted add the cabbage, onion, and apple. Carefully turn to mix. 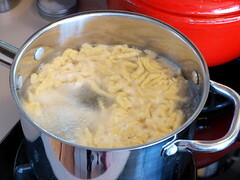 Add the remaining ingredients, except the cornstarch and water, and bring to a boil. 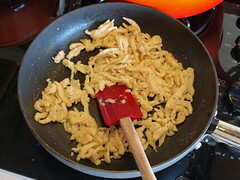 Reduce the heat to low, cover and cook for 1 1/2 hours stirring occasionally. Remove the lid and bring back to a boil. 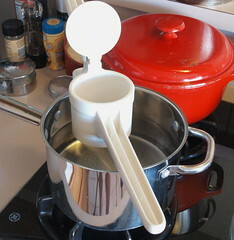 In a small bowl combine the cornstarch and water. Pour that mixture into the cabbage and stir to combine. Turn off the heat and let cool for three minutes before serving. 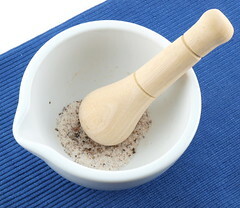 In a medium bowl combine the flour and salt. 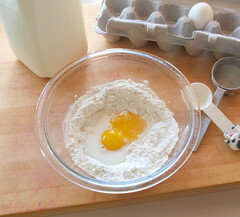 Make a well in the center and add the milk and egg yolks. 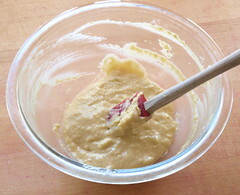 Mix until smooth, adding more milk if needed to make a slightly loose dough. Bring the water to a rolling boil. Press the dough through a potato ricer, or a colander, into the water. Boil for five minutes then drain well. 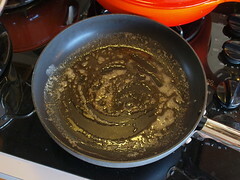 In a large skillet over medium heat melt the butter until it starts to brown. Add the parsley and the spatzle and toss to coat. Cook for one minute. Voting for Challenge 2 is from 9/27 to 9/30 … and you can view my profile here, as well as check out all the other contestants!